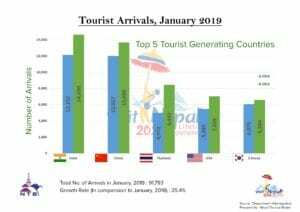 Year 2019 begins with a very encouraging growth trend in tourist arrivals to Nepal. According to the Immigration Department (and its offices) 77,300 international visitors came by air and 14,493 came overland to Nepal in January 2019. In aggregate, a total of 91,793 visitors came to Nepal, a cumulative increase of 25.4% over the same month in 2018. Tourist arrivals from India in January 2019 increased by 20.6 % in comparison to the figures of January 2018 and reached 14,650. The overall arrivals from SAARC countries registered a sturdy growth of 11.6 % over the same month last year with 17,432 total tourists. Likewise, 13,688 Chinese tourists visited Nepal in the first month of 2019, which is 14 % more than the figures in January 2018. The visitors from Thailand, Japan and South Korea have also increased significantly by 69.8 %, 38 % and 8.4 % respectively in comparison to the figures of January 2018. The European outbound to Nepal has also surged with healthy growths from the key European source markets. Arrivals from the United Kingdom, Germany and France were 4,130, 1,549 and 1,375 respectively with 27.2, 19.7 and 19.8 % growth rates. The total European arrivals in January 2019 reached 11,966 with regional aggregated growth of 20 %. Total number of the US visitors to Nepal in January 2019 was 7,028, an increase of 28.1 % over the figures of January last year. The number of Australians visitors to Nepal has grown by 31.3% to 3,527. 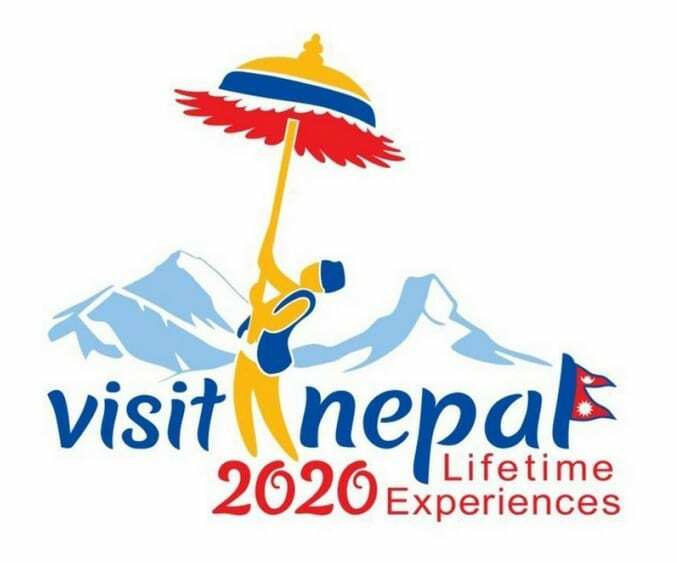 Deepak Raj Joshi, CEO of Nepal Tourism Board remarked that the growth in the international visitor arrivals in the very outset of 2019 is possible because Nepal has continuously spread positive message internationally. “We appreciate the support from media and all tourism stakeholders for the sustained growth that has well continued in 2019. This growth has encouraged us to work even harder to harness the strengths of both public and private sector in the days to come “he added. SINGAPORE - As reported in local media, Singapore Airlines will add a medium-range Airbus A350. It will be added to the airlines fleet from 2017.